The Picture Butte Blades Atom team took home the provincial championships. Hosted March 14-17 at the North County Recreation Complex, not only did the Picture Butte Blades host the Atom B Provincial Championship, they also placed first. Going into provincials, the team was fired up, after a disappointing loss the weekend before. “The weekend before, we had lost out in the semis of the league,” said Shawn Van Nistelrooy, Atom head coach, registrar for the Picture Butte Minor Hockey Association and head chair for the provincial committee. The Blades faced off against teams from High County, High Prairie, Kitscoty, Eckville, Chestermere, Westlock and Castor for the provincial title. In addition to being the host team, the Blades had also placed first in Zone 5, an area that covers southern Alberta. The provincials gave the Blades a chance to play against teams they wouldn’t otherwise play against. Picture Butte was the most southern team in the provincial tournament, with the most northern team, High Prairie, being located over 830 km away. Round Robin play began on Thursday, March 14. The Blades faced off against the Kitscoty, winning 6-4. Chestermere won their game against Eckville 4-1; Westlock against High Country 3-1; and 3C’s Castor tied with High Prairie 6-6. Friday, March 15 saw the Blades win their game against Chestermere 9-1. Kitscoty tied with Eckville 3-3; 3C’s Castor against Westlock 9-4; and High Prairie against High Country 6-4. Saturday, March 16, saw the Blades win against Eckville 8-1. Kitscoty won against Chestermere 9-4; 3C’s Castor against High Country 7-1; and High Prairie against Westlock 13-4. The championship games were held on Sunday, March 17. The Blades won their semi-final against High Prairie 7-3, while Kitscoty won theirs against 3C’s Castor 12-3. In the final, the Blades took home gold against Kitscoty 6-4. 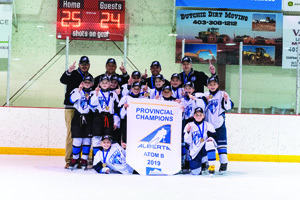 As they lost their last game in the semi finals for their regular league play, winning the provincials championship brings a satisfying end to the Atom Blades’ 2018/19 season, which Van Nistelrooy called a “fairy tale story, from start to finish” for the players, and he predicts a great 2019/20 season for all of the Blades teams and Picture Butte Minor Hockey Association. Van Nistelrooy thanked all the parents, sponsors and volunteers who helped make provincials possible, Lanny McDonald for being the keynote speaker at the banquet, the rink staff for doing a phenomenal job at keeping the ice ready and Chantal’s Concessions for running the concessions and keeping people fed.